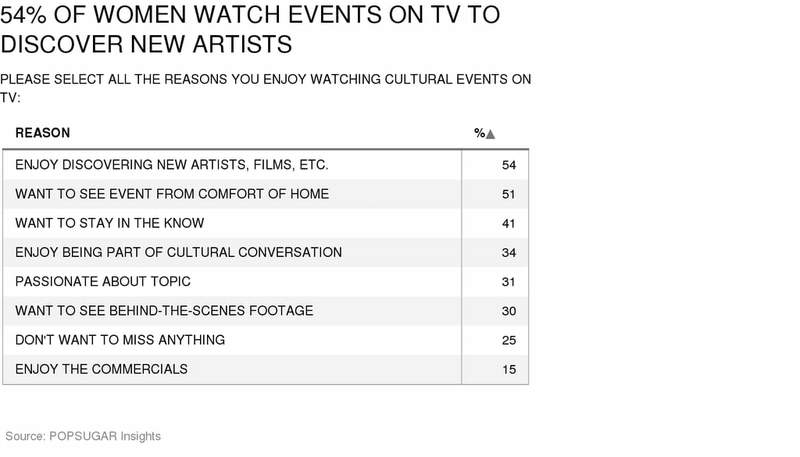 Whether it's to see their favorite band play their new song or see what their favorite actress is wearing on the red carpet, women tune in to watch cultural events on TV for a variety of reasons. As part of the POPSUGAR Insights Content, Commerce, and Culture study, we surveyed over 1,500 women between the ages of 18-44 and asked them to share the primary reasons they tune in. Discovery is the number one reason for tuning in, with 54% of women saying that they enjoy discovering new artists or films. Comfort is the second most popular reason, with 51% of women saying that they want to be able to watch the event from the comfort of their own home. Beyond discovery and comfort, #FOMO and passions drive the next few responses. Forty-one percent of women say that they want to stay in the know when it comes to topical events, 34% percent say that they enjoy being a part of the cultural conversation, 31% say that they are passionate about the topic or subject matter that is being presented, and 30% say they watch because they want to see the behind-the-scenes footage that they wouldn't see if they went to the event in person. One in four women say that they don't want to miss anything.